Did You Know You Were Missing? Seriously, did you know i couldn't see you? Blogger had a glitch worldwide and i and many others were only seeing one blog post at a time in their reading list. So if you didn't pop up then i missed your post. When i had time i would trawl through and open every blog on my list in the hope that you had posted something new, but many of you seem to be as slack as me and haven't written for a while. Anyway, they have fixed their problem and you have all returned to me. Its been a busy month and apart from a few link posts (which no one seemed interested in) I've been pretty quiet on the blog scene. I know my readers are probably thinking "and its been a blessing too". Ha Ha I'm also told that its blog suicide to stay away too long but i do what i can. My right elbow (I'm right handed) is still aching and I'm having acupuncture and physio twice a week (I'm paying for his "beema" I'm sure). 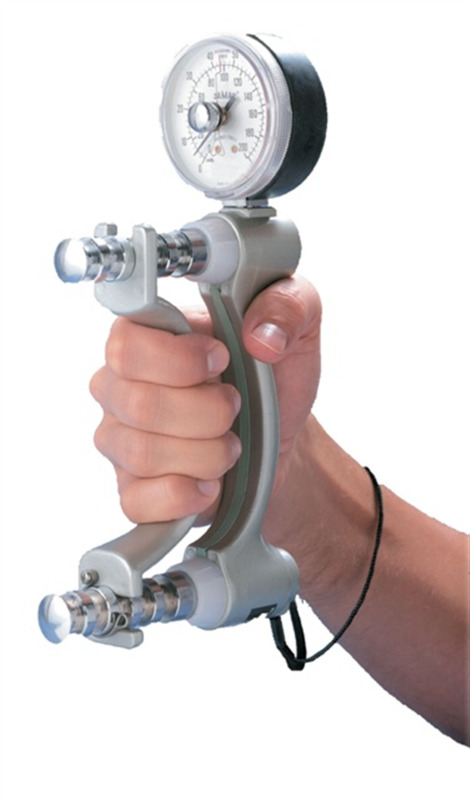 I've now reached 12 in grip strength which, having started at 4 post injury three weeks ago, is on the improve. My weaker left hand averages 40. I must be accident prone at the moment because I've torn my groin this week as well. Honestly, have you put an icepack on your inner thigh lately? Neither have i, its too cold. You really have to picture this one. When i leave the office I'm usually the last and so i flick the switch for the door in my office and then bolt out of the room, through the foyer, through double glass doors, down steps and then scoot under the lowering roller door (its not a big distance actually). Usually its just a little bend and I'm under, no problem, I'm short. Wednesday, i paused to turn some lights off and kinda ducked without thinking and it was much lower (I'm sure it goes faster in the second half) and rather than hit the concrete with my hands full of bags i did this sideways twisty move which saw me struggling to stand back up. Something had to give and that was a muscle in my groin. I'm not the right build for limbo, believe me. I think the problem is that i act and move like someone much lighter than i actually am. You know how you have that picture of yourself and your abilities and it in no way actually matches reality? I'm more your wrecking ball kinda gal (no reference to the song or video clip at all) and not your tennis ball type. I do damage when I move. I mean, in my mind I'm invincible but perhaps I'm also just a little stupid sometimes. Its a cold wet Sunday and I've already been out, got wet, and I'm slowing drying out so what better way to pass the day than to share some of activities through the last month. Its an excuse to unload some of the photos off my phone as well. The big news is that this week Hubby secured a good job as an Electrical Technician. He'll be doing lots of programming and networking which is right up his alley. He's spent the last three months recovering from surgery on his foot. With so many Electricians out of work (1000 put off in the last six months) we were all a little afraid that his age and his workplace injury might go against him. Its sad but that's reality. He put in an application not thinking anything would come of it but hallelujah, it paid off. He was one of only two interviewed out of hundreds of applicants and he found himself an employer that appears to consider 35+ years industry experience a bonus but also appear to be on the same wavelength with regards to work ethics and treating people with respect no matter their position. For example, his boss saw him standing up working and asked him if he would like a stool, and then went and got it for him. Sounds like such a simple thing but Hubby has been used and abused by his employers now for several years and has become very gun shy. His new employers are not labour contractors that treat their Electrician like units, nor do they have a culture of drinking, footy and smoking clubs outside whilst the non-smokers do the work. 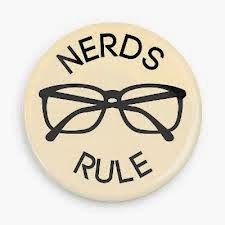 In fact, they are in the same age group as him and appear to be just as big nerds as he is (sorry Hubby). Hubby enjoys talking techo with the Engineers and was very happy to find a Silicon Chip (his bible) on the lunchtime table. He started Thursday this week having got special medical clearance and flies to sunny Cairns on tomorrow morning for 8 days. Its a bit of a shock, really, and none of us were prepared for this a week ago. So we will just adapt. I think Tom will find it hard not having Dad at home. His foot is not really a 100% but it not going to be when they have severed the plantar fascia tendon to only leave 10%. He's bought the best boots he can find. Did you know you can get fibreglass caps instead of steel caps which meets the Australian Standards for safety boots. You buy them (ascent-delta-black) from Athlete's Foot and they are much lighter. 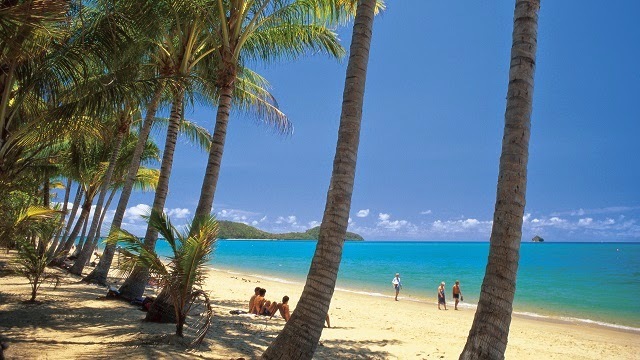 Its cold and wet in Melbourne so I'm sure he can manage the 25 degrees Celsius average in Cairns in Northern Queensland. My gardening projects have been a bit on the back burner and apart from almost finishing the sleeper frame around the new grass area we haven't done too much. The stump from the tree we cut down is directly in the path of the framework so we have to wait. Since it looks like Hubby is going to be away often and id like him to be relaxed when he is at home, I'm going to have to hire in some muscle. Craig (Edible Gardens), I'm thinking of you, so expect a call. One of the ways to get my men interested in gardening is to give them some toys. 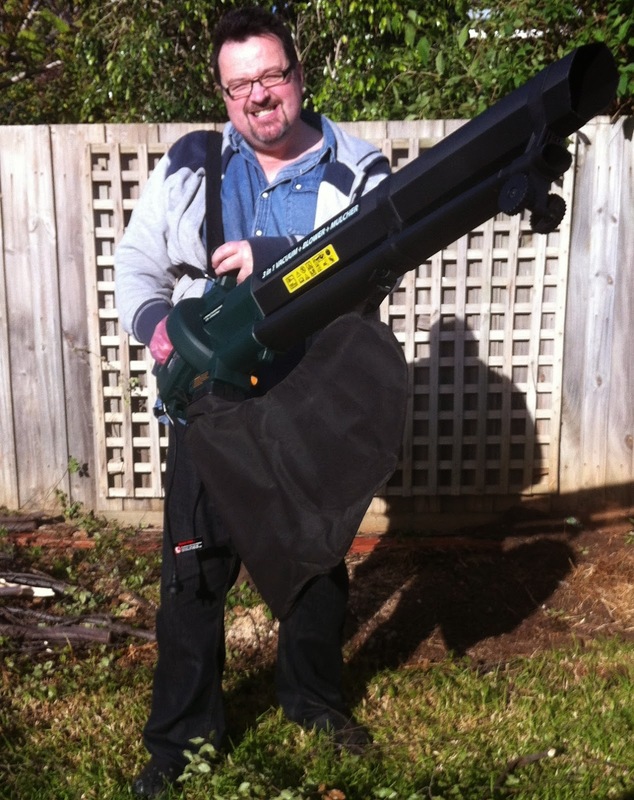 Having downed the tree which was about 4m tall with Hubby's baby electric chainsaw, I bought a mulcher, normally priced at $279 at Bunnings, for only $99 on Gumtree. Less than an hour later it was in my yard. It had only been used once for a small hedge and was as new. The men having fun poking stuff in and watching it gobble it up. So where was Tilly when all this "boy toy" stuff was going on"
Since we have a large deciduous tree in the front yard that puts leaves everywhere we also bought a blower vac which makes really great mulch. I've got a question to ask that I've always wanted the answer too. Why would you ever blow stuff everywhere when you could vac it up and then just empty the bag where you want it? Spending time with the salesman in the garden tool section (an older, real tradesman who knows his stuff) he told us that the $39 blower was actually a better model than the $79 one which was an older and less efficient machine. 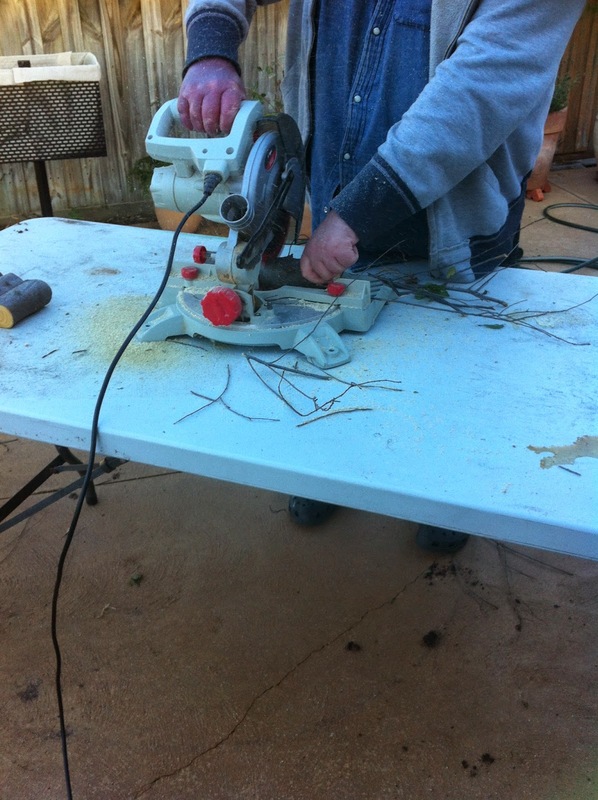 He also spent a lot of time teaching Hubby all things chainsaw related and offered to take his blunt one home to be sharpened for $5. I was pretty impressed with the lovely mulch the blower vac made and i spread all around the veggie beds. The worms are going to love me. 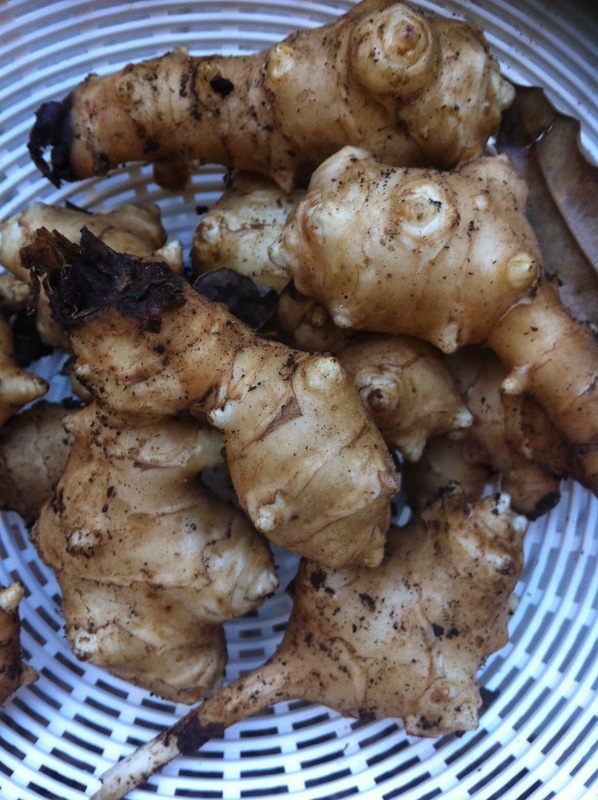 Speaking of leaves, buried under said pile of leaves in the area under our power box and near the gas meter (usually a dead area) i found a crop of Jerusalem Artichokes which i threw in there ages ago. I haven't attended them at all. I have managed to put some seedlings in and sprinkled some beds with lettuce and radish seeds and transplanted some of my herbs from a bed that needed filling. A couple of weeks later they seemed to have survived. We have had some ferocious wind storms lately and I'm grateful that the soil level in my beds is about 20 cm from the top and so the small plants were/are protected. 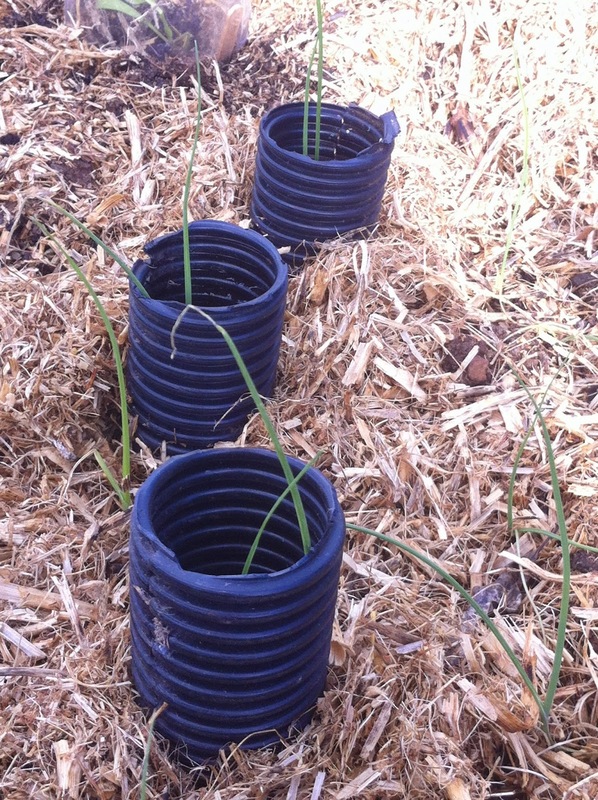 My leek babies have been "tubed" not only to protect from munching things but also to blanch the stems. Ive split the tubes lengthwise as well so they can be removed but also i can add another section on top when they start to grow. By keeping the stem in the dark (blanching) i will get long white sections of stem on the leek. Its an experiment i hope works and it was just scrap pipe from behind the shed. 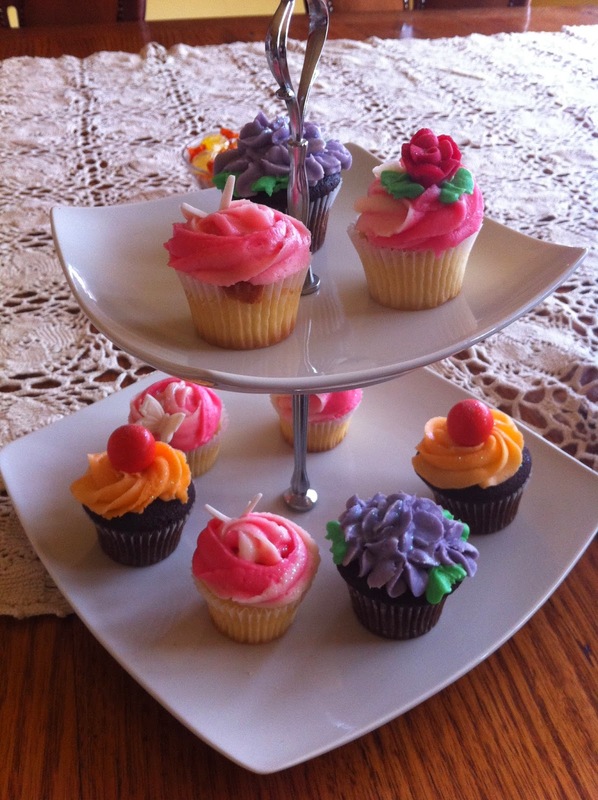 It took some work to make them (about 20) but ill have them now forever. 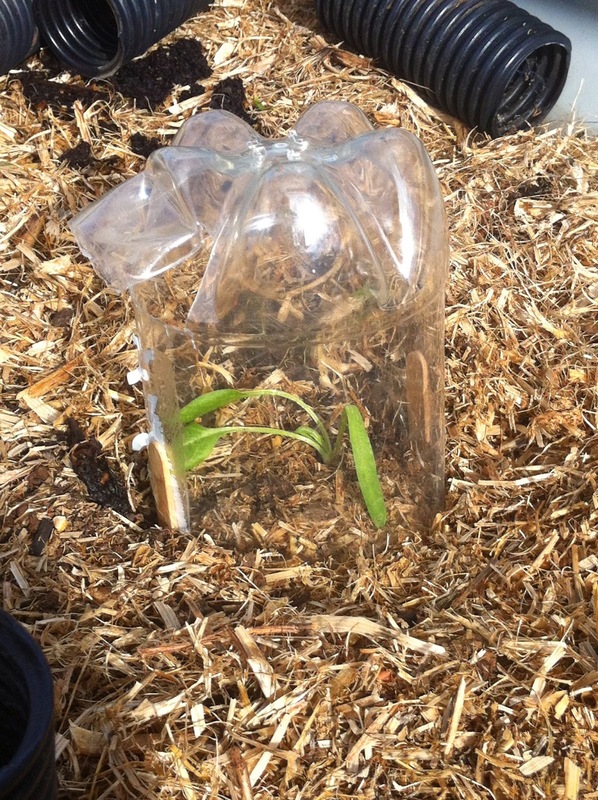 These drink bottle houses were made last year to protect seedlings while they are little. This is Ironman Spinach. 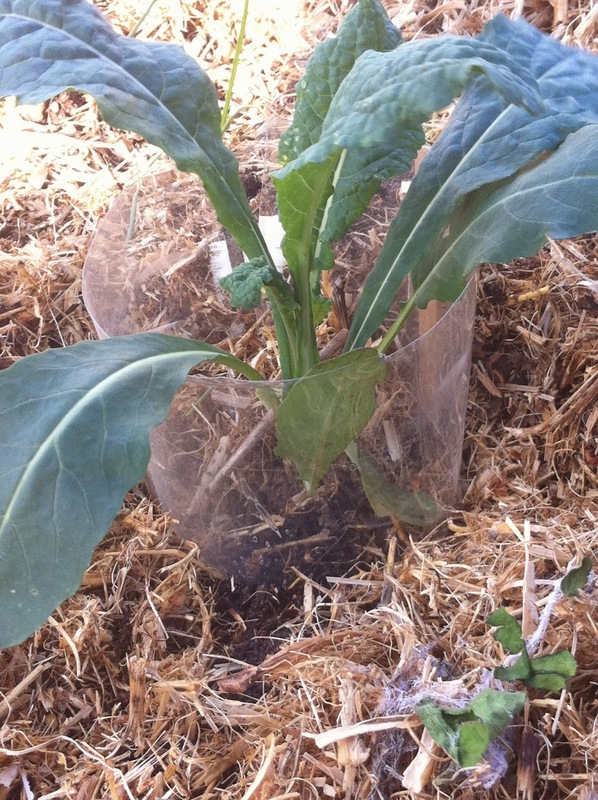 Drink bottle sleeve protecting my kale plant from snails and slugs. Potato Onions going gang-busters. This bed also has garlic in it that are starting to come up. 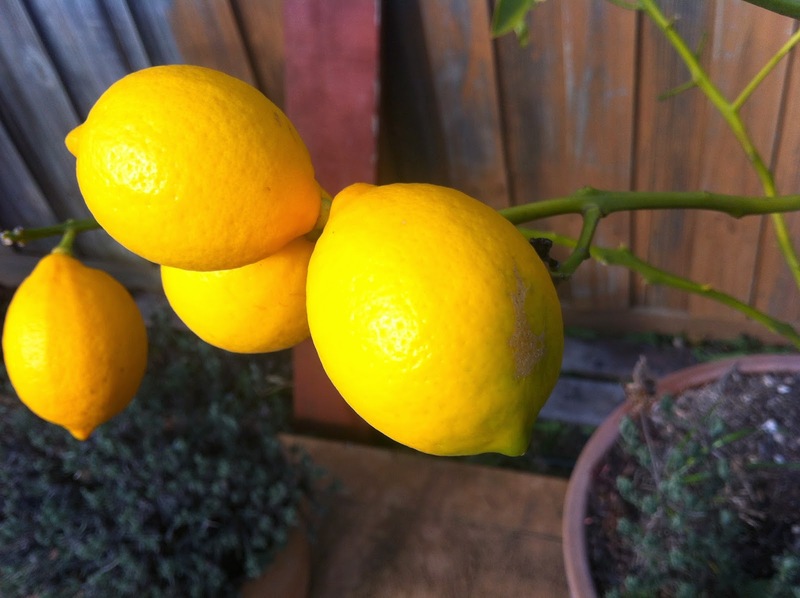 Have you seen such beautiful lemons? No leaves on the tree but the fruit is amazing. I love this yellow. 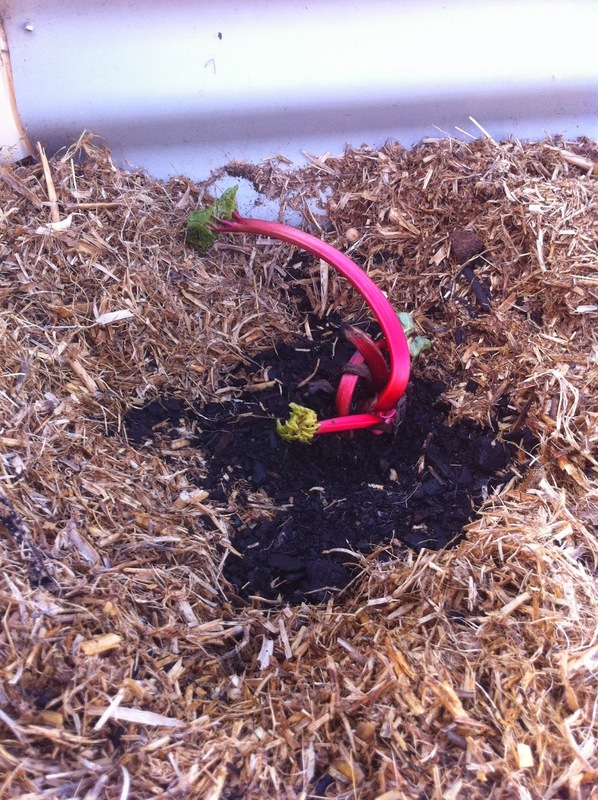 My first rhubarb crown has gone in. 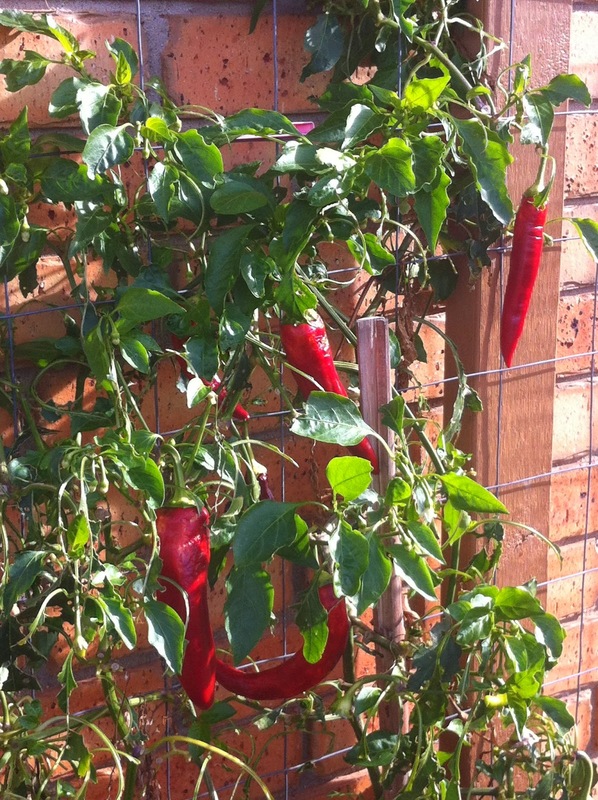 My peppers just keep on growing. The watch that i won from a competition on Greening of Gavin arrived from the US. It is beautiful and so light that you hardly know that it is on. 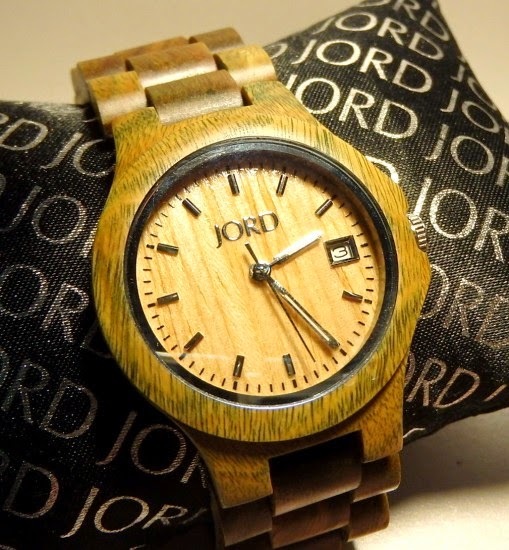 This is the link to Jord Wooden Watches - great gift for "eco friends" who already have all their garden items. The whole time I've been typing this Tilly has been asleep on the desk between me and the keyboard. Time to move and go help my Hubby pack for a week away. Ten Acres Enough - A Book Scam from 1864? Warning - being my gullible self I got all excited when i starting reading this book. It was referenced in another blog and of course, i started chasing it down. 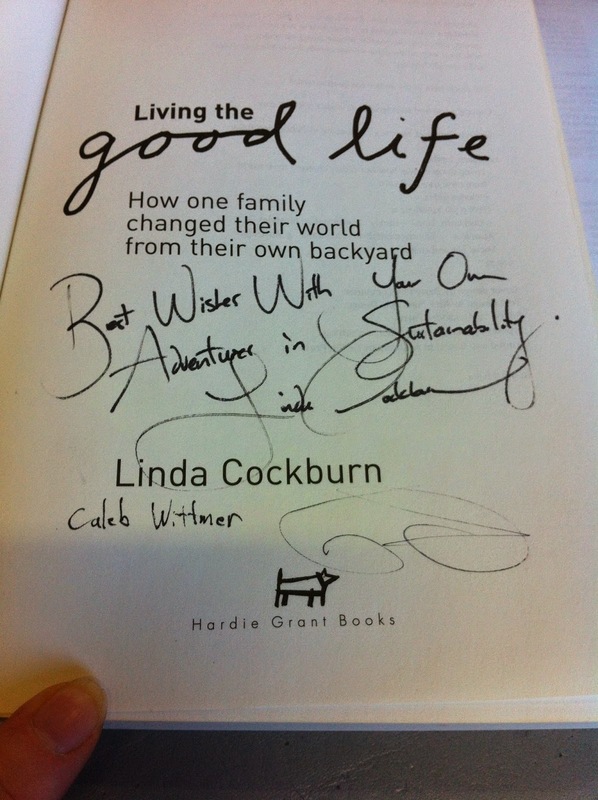 Who wouldn't want to read an actual account of a families journey to self sustainability written in 1864. The following is what got me all excited. When you have finished, be sure to read the discovery by a librarian in 2013 that follows. a practical experience, showing how a very small farm may be made to keep a very large family. With extensive and profitable experience in the cultivation of the smaller fruits. Published 1864 by J. Miller in New York . book, without doubt, would have found more readers. is the great agricultural sin of this country. to teach them any thing new. All sounds good doesn't it and certainly wants to make you run out a get a copy. I wanted to know more about the author and so i did a little more research and this is what i found. Seems im not the only one who likes to dig. "Authority File: noun Library Science. a file, either on cards or in machine-readable format, in which decisions involving bibliographic records, particularly for form of entry, are recorded to establish a precedent or rule for subsequent decisions and to provide for consistency of entries." This process of determining accuracy of information extends to verifying the origin of citations and of authorship. 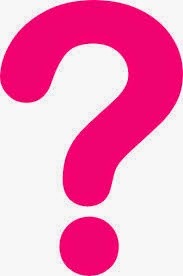 It's vital to the process of cataloging and of library research in that to provide a person with a book, document or quote that is not verifiable and true is misleading and damaging to both the reputation of the library, the librarian and ultimately to the work of the person requesting the information. With all good intentions I was referred to the book Ten Acres Enough, by Edmund Morris, 1864, as an excellent and well known book on how to start your own farm as well as on self sufficient farming. 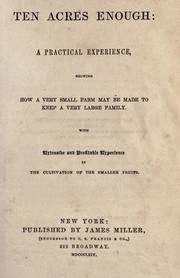 It's been reprinted numerous times, is thoroughly praised over and over in magazines and reviews and generally considered to be the classic American go-to book on mid 19th century small farming technique for the homesteader. So I bought a copy. I also bought copies of a few of Morris's other books. I read Ten Acres Enough and then the librarian hairs on the back of my neck stood up. The final chapters deal with the advantage of buying land in New Jersey for the purpose of homesteading, particularly berry farming. The entire book is about one person's experience in moving from the financial world to creating his own farm in New Jersey during a deep economic depression. And succeeding in this endeavor in record time too. Note also that in the first edition of Ten Acres Enough, the author is not named. It's only from the other titles that Edmund Morris has been attached as the author. Being who I am, I looked at the verso, the opposing page to the title page, to see who copyrighted the book. It was not Edmund Morris but the publisher, J. Miller. Bong Bong Bong. In each of the other Morris books, the publisher held the copyright. It was not uncommon during the 19th century for women to write a book and for their husbands to copyright the book. Unfortunate but true. For a male author to hand over copyright to a publisher is rare and in my experience in 19th century books, almost unheard of. Morris wrote a number of books and was, by the subject matter, a true entrepeneur. So why would the publisher and not Morris hold the copyrights? Returning to the books to examine their construction, it's apparent they're printed on inexpensive paper, cloth bound with a fancy embossed cover but nothing that I would say was of any value. I checked the Burlington, New Jersey records for an Edmund Morris. The only Edmund Morris that I could find was born 1804 in Philadelphia, PA and died May 9, 1874. Next, Appleton's Cyclopedia Of American Biography. It's important to remember that this reference too is suspect in that the contributors were not subject to examination. We don't know who wrote this piece or from where the information was obtained. It may very well have been his obit and as such, glowing. "MORRIS, Edmund, journalist, born in Burlington, New Jersey, 28 August, 1804; died there, 4 May, 1874. He received a good English education, learned the trade of a printer, and at twenty years of age was editor and publisher of the "Bucks County Intelligencer" at Doylestown, Pennsylvania He subsequently conducted the" Ariel" and the "Saturday Evening Bulletin" of Philadelphia, where he introduced the custom of selling newspapers on the streets. After editing and publishing for several years the Burlington, New Jersey, " Gazette," he removed in 1855 to Trenton, New Jersey, and took charge for two years of the "New Jersey State Gazette." In 1857 he returned to Burlington and resided there until his death. During and after the war he wrote regularly for the "New York Tribune," and was otherwise a frequent contributor to the press. He devoted much attention to the subject of farming, publishing "Ten Acres Enough," an attempt to teach the advantages of intensive cultivation, and " How to Get a Farm and Where to Find One" (New York, 1864), and "Farming for Boys" (Boston, 1868). He also edited " Derrick and Drill" (New York, 1865), a compilation of information regarding the oil-fields of Pennsylvania. He wrote several pamphlets on silk-culture mid other practical subjects, and made numerous inventions. He is said to have been the first in this country to print in more than one color. Mr. Morris was a member of the Society of Friends, and for years an earnest Abolitionist." From the period journals reviews, it's clear the purpose of the Morris books was to fleece the desparate who had been hurt by the economic crash with dreams of owning a farm, living off the land, etc. 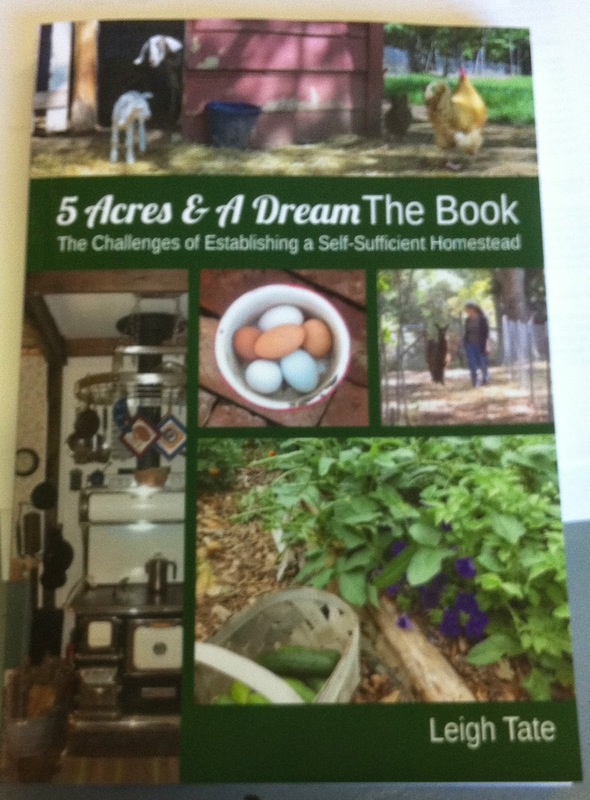 It is likely that, once a customer bought the book, a followup personal visit or mailing from the real estate agent would be in order in an attempt to sell the unsuspecting would-be farmer land in New Jersey and Pennsylvania. I would not be surprised to find that a deal was in there for sales of farming and garden supplies too! The Appleton's entry, which does sound like an obit to me although I haven't checked that yet, does clarify that Morris was a writer first and formost. Take into account the damning reference to his having pulled an entire chapter from another gardening book, the clear bent of his books as 'get rich quick' or 'survive the crash' schemes which primarily put cash in his pocket and you have the makings of a neat 19th century writer who figured out how to smooth over his morals, publish books that appeared to 'mean something' and make a living for himself. Or, he simply ghost wrote the books for J. Miller, the publisher who specialized in cheap children's books. Remember that Morris had the connections and ability to publish on his own, yet he didn't publish these books. Instead, he went to J. Miller. That begs the question of why would Morris do such a thing when he would make more profit by publishing his own books? Perhaps he owned an interest in J. Miller, Publishers. Perhaps he was J. Miller, Publishers. Either way, it wasn't until after Ten Acres Enough was a sales success that Morris decided to expose his authorship in the title page of subsequent 'get out of jail free' books. Is there value in the content related to farming and gardening, to oil drilling and silk culture? 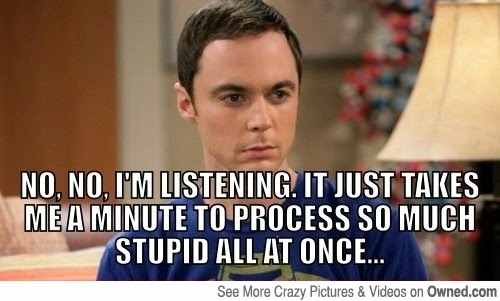 Quite possibly. You'd have to be the judge of that if you choose to read any of his books. Just remember that Morris didn't write with the purpose of helping you to be a better farmer or oil driller. He wrote to support himself. Go to the link above and read some of the comments that follow this post. At the very least its a good read and Morris certainly knew how to write a good story. Its just a pity it was all a scam. I'm going to continue reading the book but view it in a different way. One of simple enjoyment. Have you heard of this book? Have you read it? I've been enjoying this series on YouTube called The Edible Garden. There are many great ideas for people with small gardens like mine. 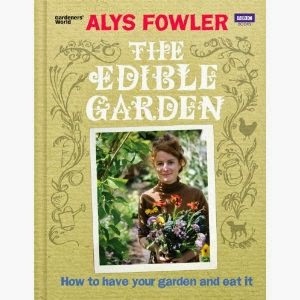 Alys Fowler demonstrates how to gain maximum growth of veggies for your family and flowers for beauty using the principles of permaculture. There are lots of crafty extras incorporated eg. in the first episode she discusses how to make wicker trellises. I can just picture myself sitting down with a certain hippy and a big pile of willow between us. This YouTube clip is about America but it could be about any one of our nations, including Australia, especially now. Please don't think that I'm being negative about America. 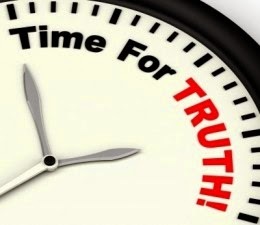 We are free to speak the truth but many of us don't because we are afraid or blinded by the smoke and mirrors created by politicians and the media. What I don't agree with is that this generation is at fault - each generation shares the blame. We all make our own choices in how and where we live our lives. Those of us that are FREE also choose who we vote for. I hope that this wasn't an acted sketch because it certainly made an impact on me. I'd love to hear your point of view. I have never played a game of tennis in my life, there were no hot and sweaty ball boys anywhere in sight and yet i have tennis elbow - from gardening, or at least doing gardening projects. 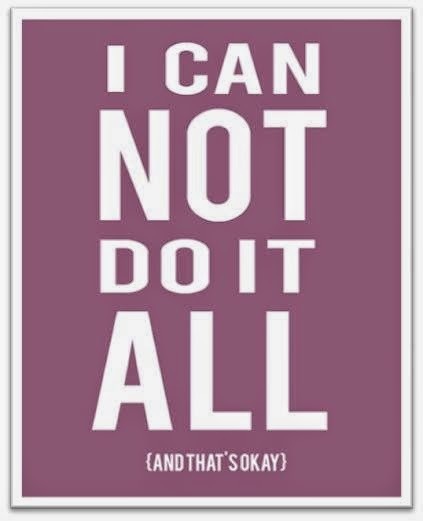 This is meant to be the week holiday where i kill all those projects that never get done or are too big to contemplate doing in a weekend. Yet, here i sit with an aching elbow from just typing a few words. Bloody fingers are connected to the injured tendon apparently (we still don't know if its torn). Hey, good thing - i can lift my coffee cup today, a small one. I still cant push the thingy down on my deodorant or perfume but hey, the coffee cup is an important step in the right direction, right? 1 - I am not a human excavator, bobcat or a forklift. 3 - I must use correct technique when lifting, shovelling or any of the activities resembling those mentioned in number 1. 4 - Don't set yourself so many tasks that you feel the need to rush when you hear the weather report forecast rain and your work time frame is reduced to a couple of days. So its short and sweet post today (thank God they say, all this moaning and sympathy seeking) and a plea to all my blogger friends to start writing so i have something to read. Sometimes it feels like there are just not enough hours in a day. Sometimes it feels like those we do have are flying past so fast they have wings. I'm on a Staycation at the moment. Normally I plan and plan and plan a holiday but a few weeks ago i just decided that if i wanted the veggie garden and backyard to be ready for the next growing season that I'd better take a week off work and get through a few projects. Box in the square of grass we are keeping for Tilly in the backyard to contain the Kikuyu. I know, its ridiculous to kill 75% and leave a small patch but Tilly does love rolling around in it and snoozing on a sunny day. 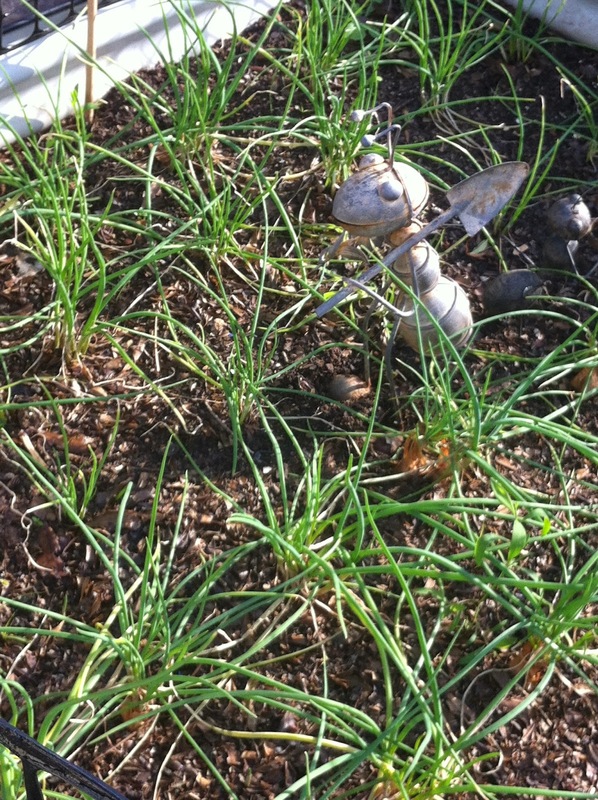 Any blade of grass escaping will be shot dead with hot water or as a last resort weed killer. 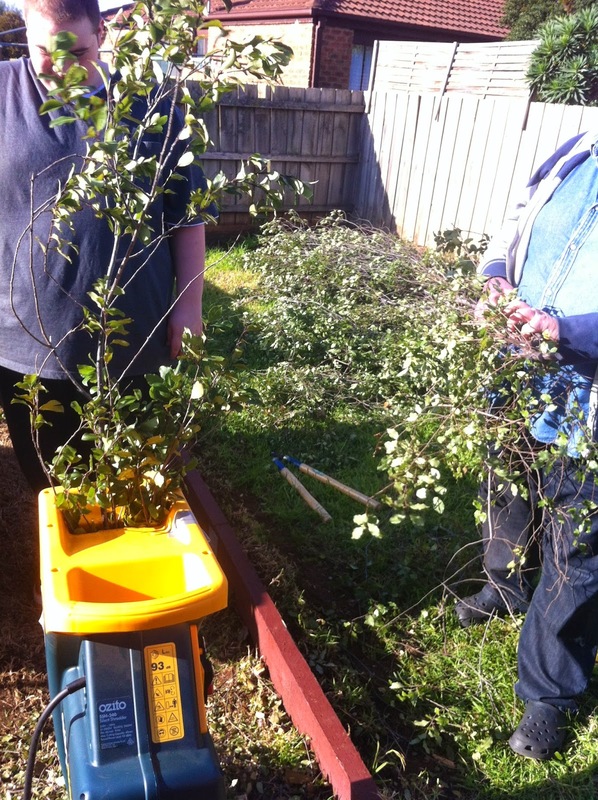 Remove James Stirling Pittosporum (4m high and about 2m wide) that sits on the fence line half way down the side. By doing this i will have one continuous line of fence making the yard look longer. As my mate Craig from Edible Garden says, "if it doesn't pay its way by providing flowers for bees or some form of food then get rid of it". 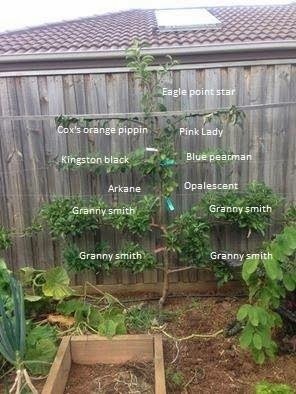 Starting at the pergola, mark out every 10 ft and put in a pole (2.4m high) to run the wire through and to support espaliered fruit trees. Craig told me to make the first wire 2 ft from the ground and then 1 foot thereafter. 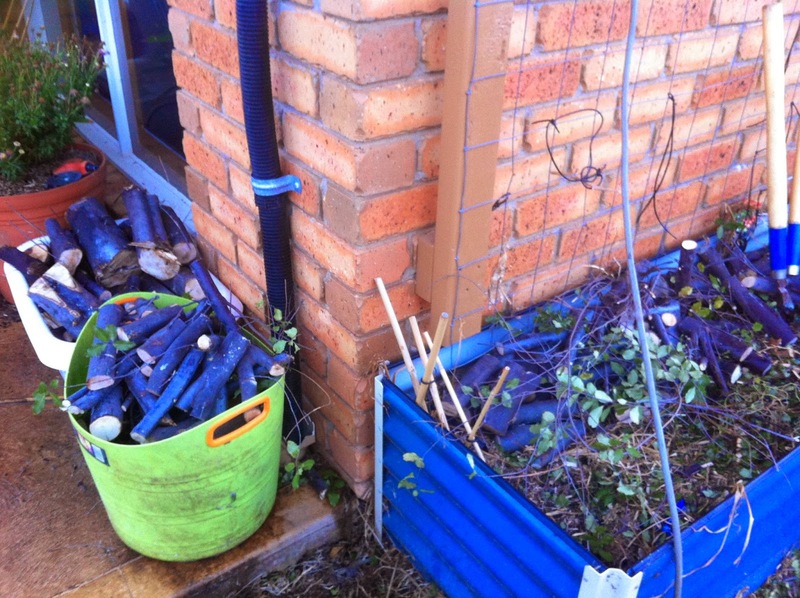 I figure i have about 15m + 8m of fence i can use. Since some of my trees will have multiple grafts i will have a veritable orchard in a small suburban backyard with some added privacy. Probably two of these frames will have cross beams to support the vertical strawberry beds i made out of pallets a few weeks ago and also perhaps a couple of gutter gardens (for micro greens). 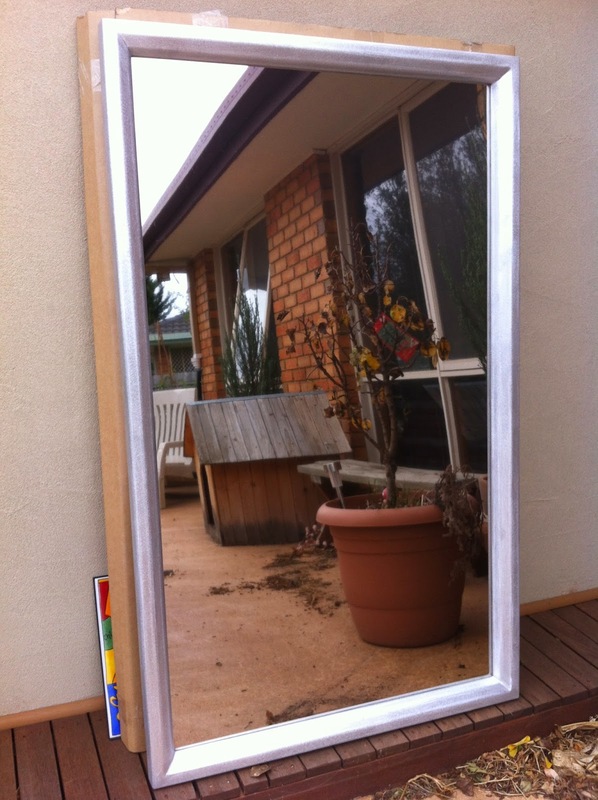 We are also trying to figure out how to incorporate my beautiful garden mirror made by the guys at work so that it reflects back across the green grass and the area in front of the pergola. Brushed Aluminium Custom Frame and Polished Stainless Steel Mirror. Paint the entire fence, poles and border sleepers. I know this is unnecessary but I'm big on final touches. Grey mismatched wooden palings are just not in my colour wheel (as Sandra Bullock said in Blind Side). 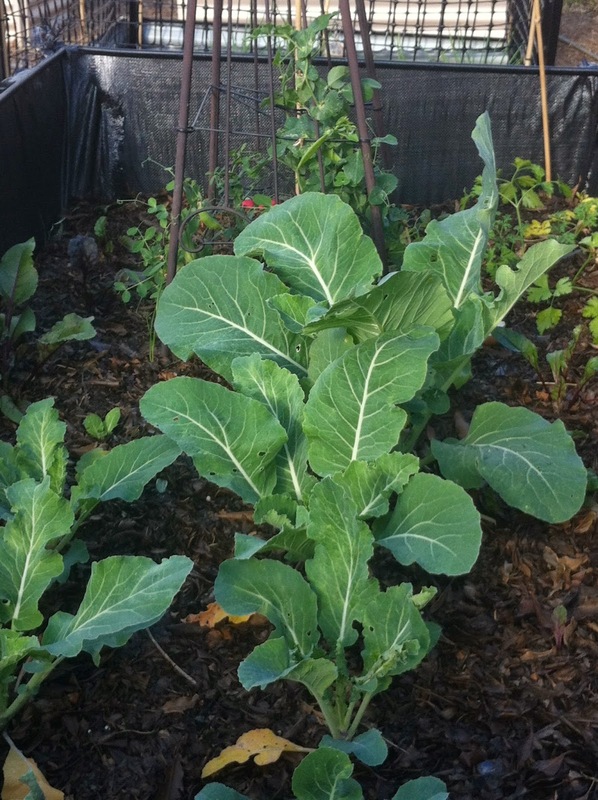 Continue lining the existing raised beds and incorporating more soil, mushroom compost and manure. 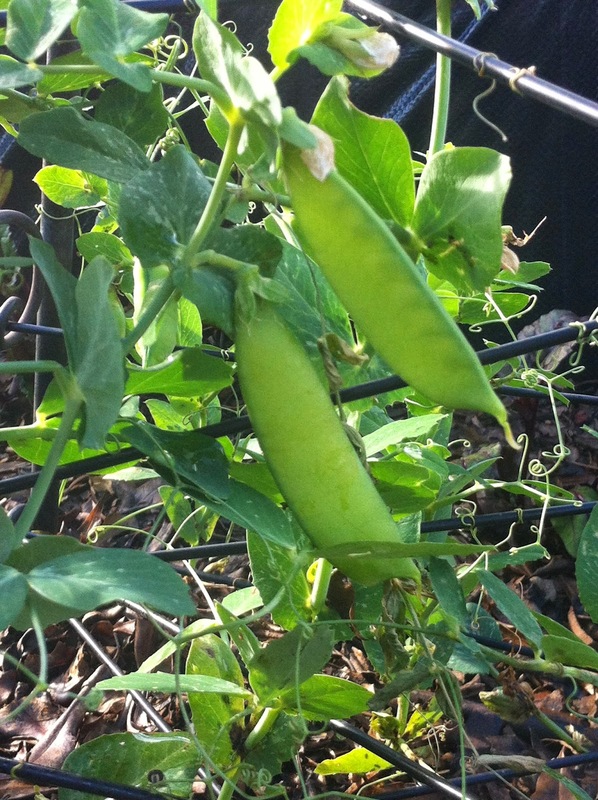 Plant some more winter crops and make the lower ones all Tilly proof. I had better leave it there. My hubby is beginning to twitch. Obviously this cannot be done in a week but i want to get a good start so that i can accomplish parts of each on weekends instead of thinking its all just too much. Now this is the picture i should have started with - i can see you all exiting to go get a cup of coffee/tea right now. On Friday (Day 1 on my Staycation) i drove to Ballarat to spend the day with Sharon from Miss Townmouse. It was my first visit to her home and i was busy checking out all the images i had of her place from her blog with those in front of me. OK, its official, she is not running around the neighbourhood taking photos of miscellaneous neighbours homes, it really is her place. Those baby bunnies are so so cute. I didn't take any photos as mine wouldn't do justice to the ones that she and India take on her blog so go check them out, later, not now! I arrived at 10.30am and can i tell you that we talked right through till 5pm. Such a great day. Mid afternoon i had my first reflexology massage on my feet and then was turned around and had an Indian Head Massage. It was really relaxing though i think you are meant to be quiet and reflective, not yak right through it. The music was on, the candles were burning and there we were like chooks in a hen house. On my way home i popped in to visit Jess from Rabidlittlehippy. Yet more talking before making my way home. Gosh Ballan is cold. It was a big day out but long overdue. Saturday my big sis turned up for her regular weekend away from the grandkids she lives with. Actually its been a few weeks with weather and interruptions (OK so Bel burst her appendix, what's the big deal) so if she doesn't turn up in a fortnight i might have to review that "regular visitor" tag to "once in a while visitor". Do you think I've gotten the message through? I really look forward to our time together. We do really exciting stuff and cancel outings to see Tom Cruise in The Edge of Tomorrow to do things like play Solitaire Wars with our smart phones over a plate of grapes, cheese, crackers and dips. If you cant work out what we are doing then you had better come over because i just might get a win in. We are really wild girls. Our usual big weekend outing is a trip to Bunnings with a quick coffee from the cafe. When getting Chinese takeaway we popped into our local video store that is closing down and having DVD sales. I was chatting to the girls and noticed that there were fittings available. Staring right in front of me was a popcorn stand. 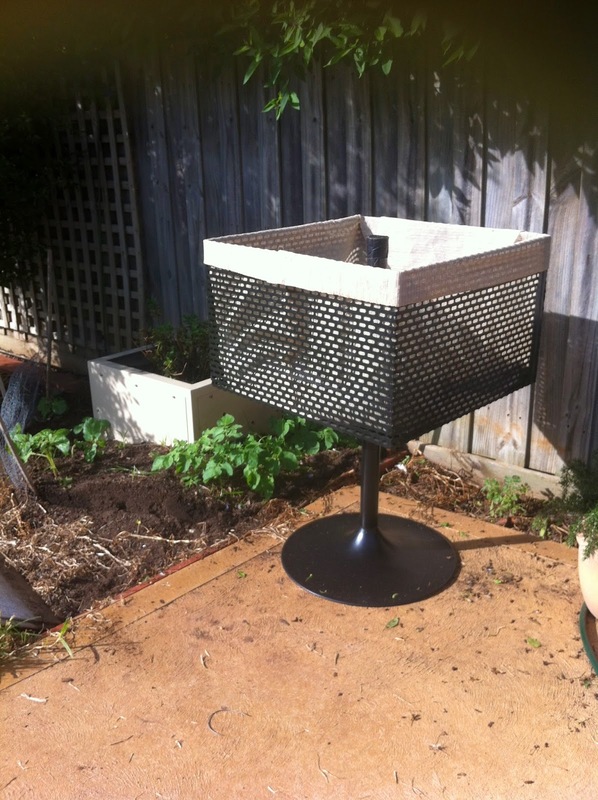 Now a potato planter lined with shade cloth. You can see on the ground all the "freebie" plants coming up. Obviously Tilly didn't get them all. Trouble is, looking at it i thought it would be light painted aluminium. I went to grab it and take it to the car and left my elbow behind. Its made of steel and very heavy. Hence on Sunday, i couldn't even lift my coffee cup. Ole ambidextrous sister of mine was having a great time laughing at me continually trying to do things before yelping and changing hands. I spent most of Sunday and Monday moping thinking that my week of work was over but here i am Tuesday and I'm already lugging sleepers around. Funny thing is i still cant turn the tap on or squeeze things, weird. 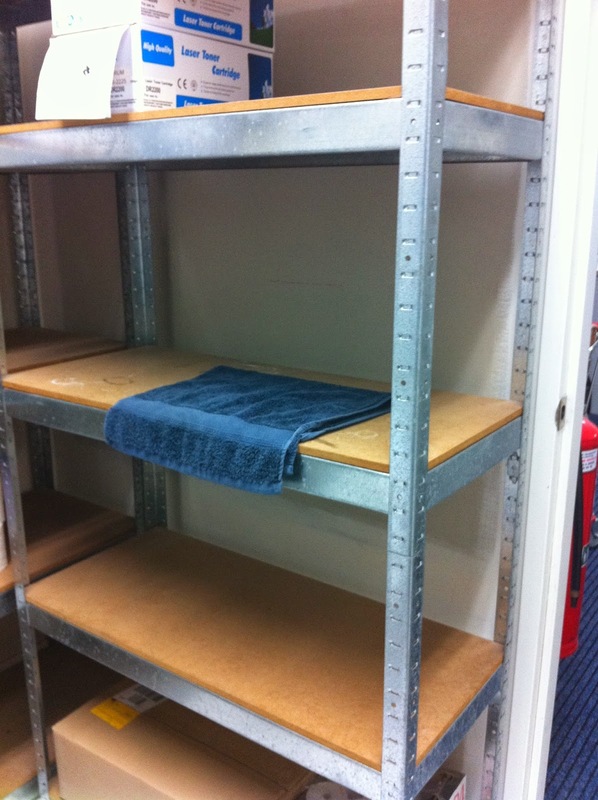 Hubby scored himself 3 of these shelving units which were in a back room. 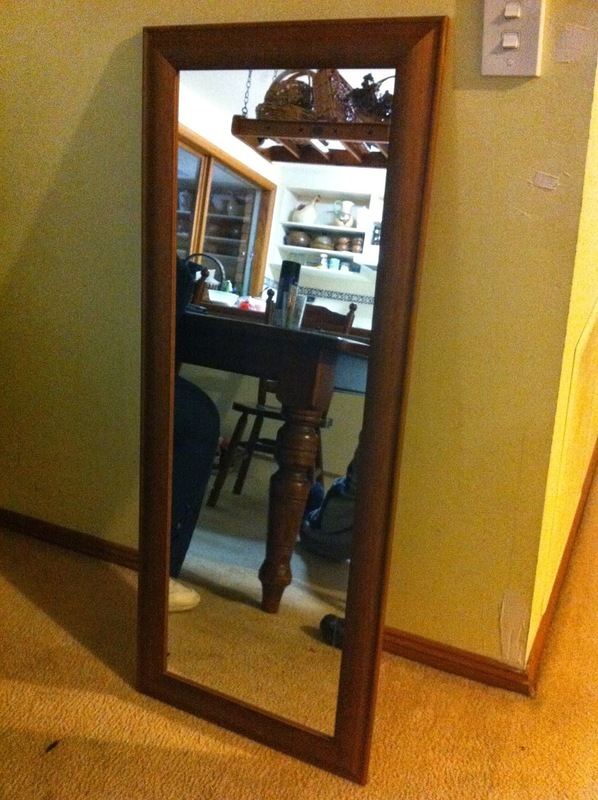 We scored a beautiful mirror which was on the back of the office door. It matches our architraves and window frames. They also offered me large office chair i'm sitting on now, the microwave and the kettle. Why not, always good to have a spare and all are as new. I've got my eye on the vacuum cleaner which is industrial but i have to wait until the end of the week as they will need it last minute. The owners are going back to New Zealand and they have to pay someone to take stuff away so they were very grateful. My sis was shaking her head and saying how can you be so up front. I laugh, that's easy, i just turn my head and look at my big behind - "more arse than class" i say. My readers, if there is one piece of advice i can leave this world with its that you don't get anything, if you don't ask! Since i started being mindful of "repurpose, recycle, reuse, reclaim, restore" i see useful things everywhere. Our factory is like a candy store now and yet i've worked there for seven years blind to it all. 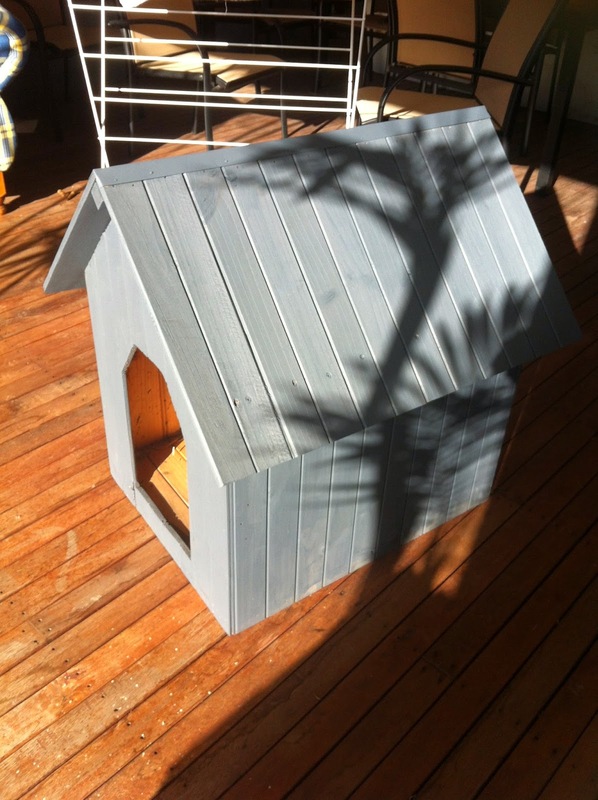 Tom was also in on the act and painted our old dog kennel not being used. He sold it for $40 to our friend (thanks Natalia). 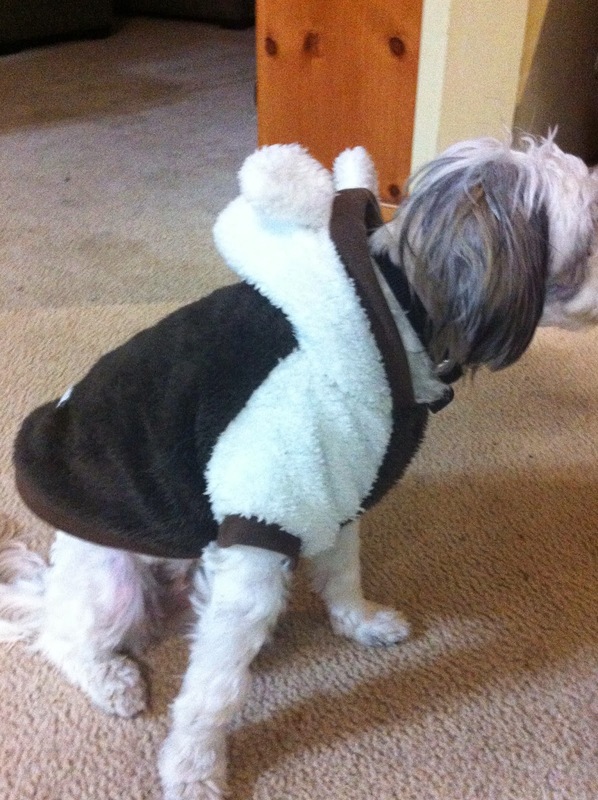 She gave him an extra $10 and also a little dog suit for Tilly which was too small for her dog. 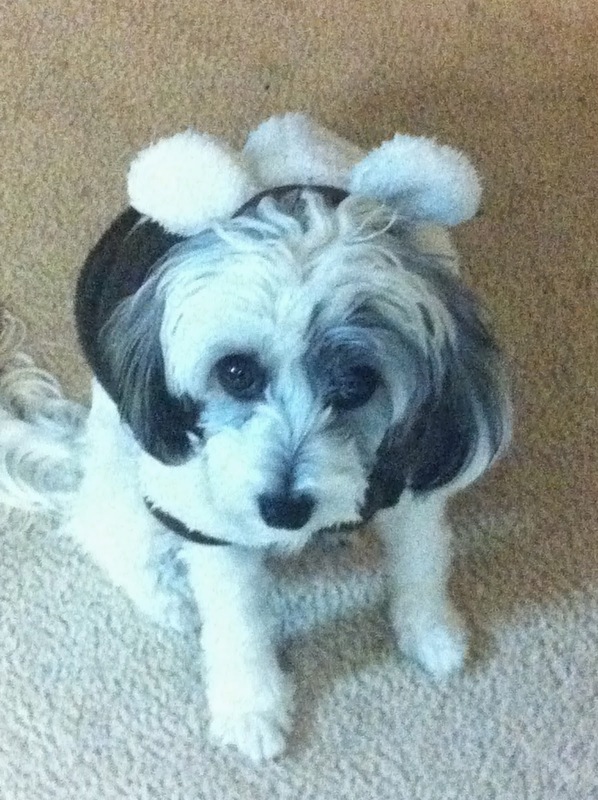 She doesn't look too happy in this shot but she really hasn't tried to take it off and she is so snuggly warm. She was recently groomed and so is missing her top coat. Whilst working in the garden i have to pull up a few plants so that I can lift the level of the soil. 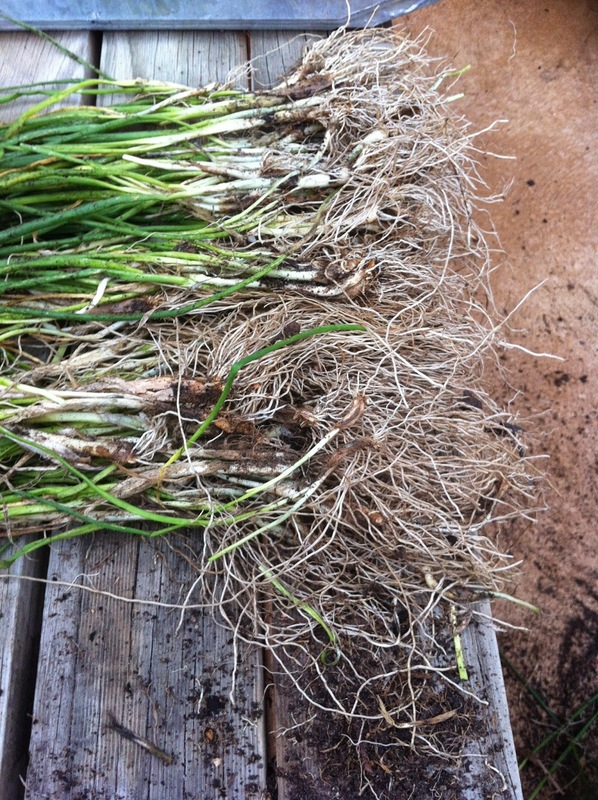 The garlic chives took some doing with the wrong hand but when i separated it out it had so many bulbs. I kept a few for myself but most have been planted into a big Styrofoam box to keep for Jess. 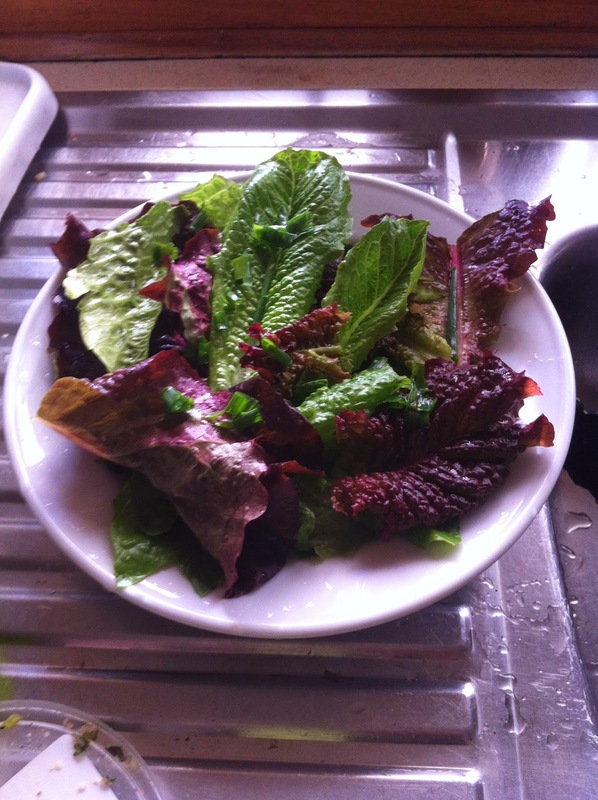 The last of the lettuce also had to be picked and so it was a yummy salad for lunch. I have masses of baby lettuce and radishes coming up in a bed I've already completed. I'm going to leave you with some other unexpected news. I won Gavin's Watch Giveaway. 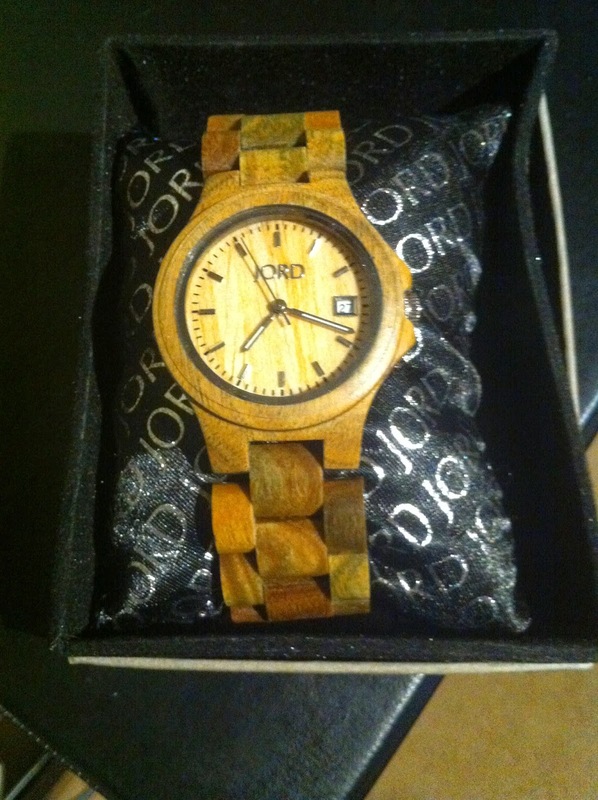 In my future is beautiful watch made from wood. I really going to enjoy explaining where i got it from, it is so unique. 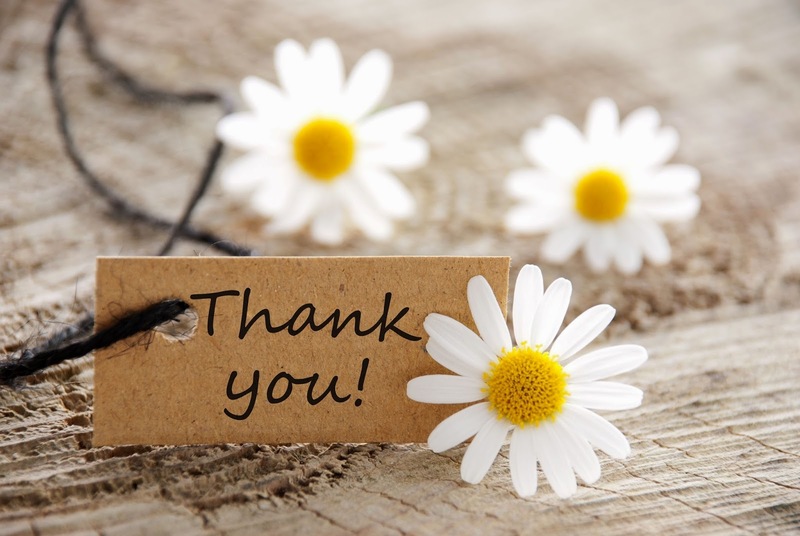 This post is a thank you note to my mother-in-law Doris. I don't need to say why for she will know, but i wanted to publicly say how much i appreciated the support she has given our family. Always the quiet voice at the end of the phone that listens and give considered advice. Never opinionated, never pushy, never biased and never asking for anything in return. I hope that she knows how much she is loved. 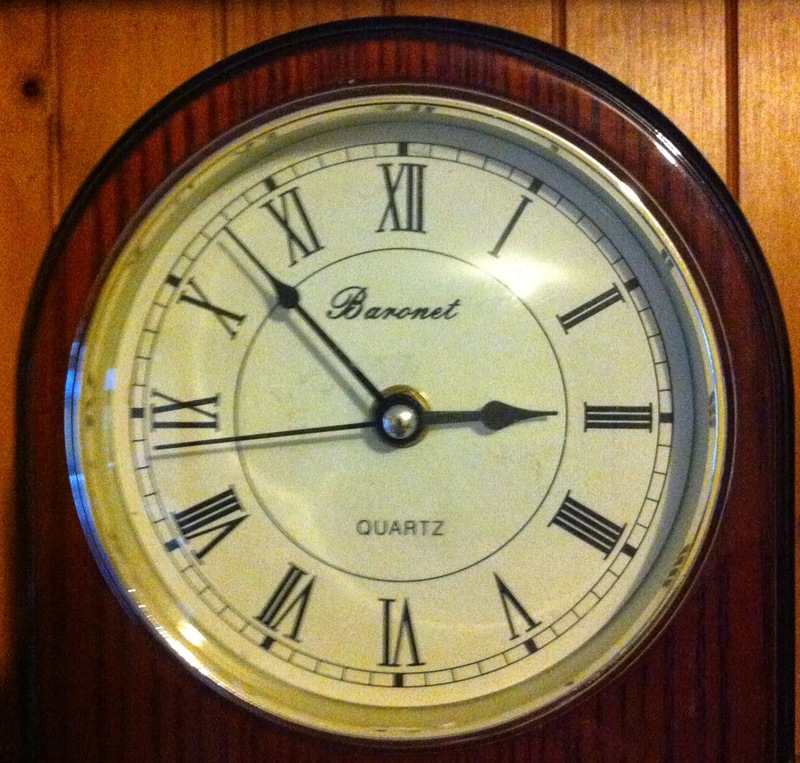 That's PM not AM on that clock and I am still in my nightie. 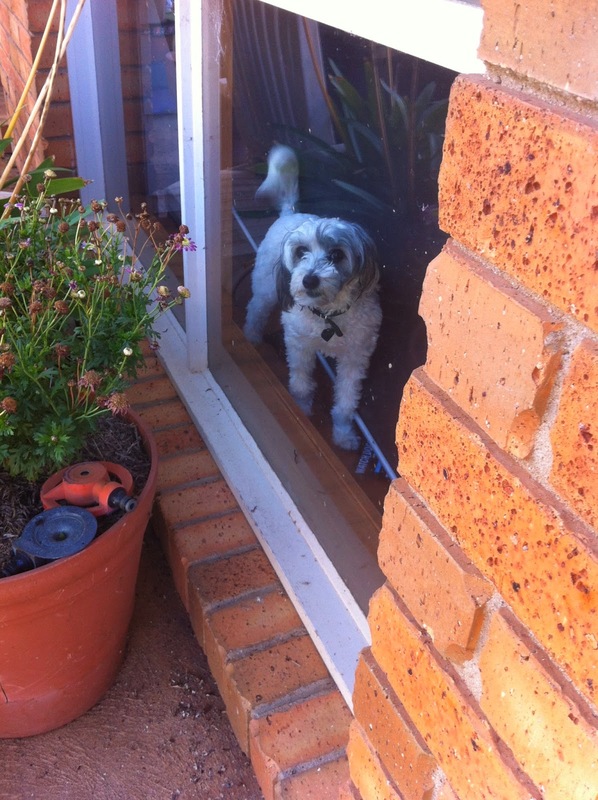 I'm wondering if i can pretend there is no one home if someone knocks on the door. A bit hard when all 3 cars are out the front and Tilly would be bouncing on the back of the door. 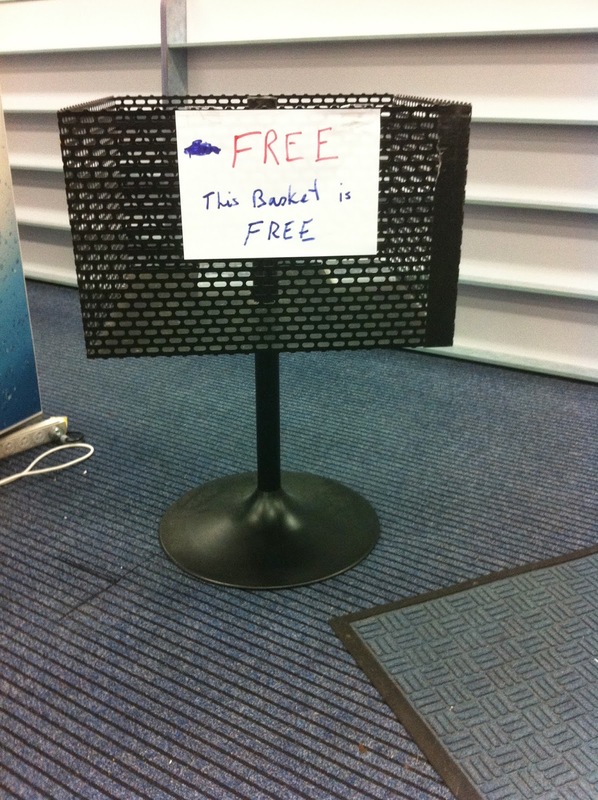 Thankfully no one comes. The French doors outside are open and it's been raining softly but steadily all night and day, the first day of winter. All my senses are being fulfilled - I'm snuggled up with a blanket and Miss Tilly, who is softness itself, listening to the sound of rain on a tin roof, with a mug (or several) of black coffee and a plate of Vegemite toast, reading. I'm slightly sore from shovelling dirt in the veggie garden yesterday and I think I've fulfilled my housework quota this weekend before I head back to a full time job tomorrow so no guilt here. It does one good to occasionally have some down time which includes not moving from the bed for the day except to re-fill the coffee mug? It's called a Thermos Lynda!!! Last night was one of those nights when all three of us were doing our own thing. Only problem was, we all did it ALL night and so lucky for me they are also in bed for the day and no one is bugging me for meals except Tilly, who wants my Vegemite toast. 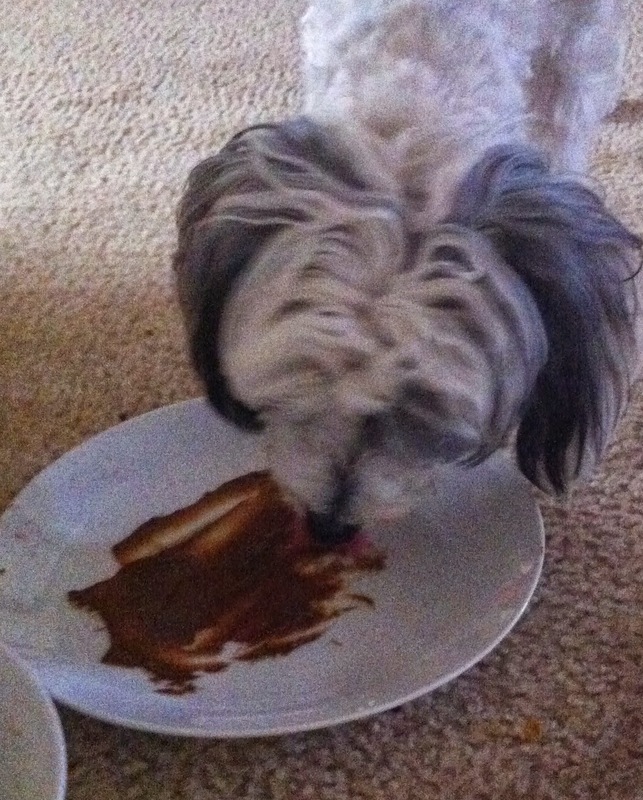 I ended up smearing some on a plate so she would leave mine alone. Boy, did she lap up some water after this. OK, so I'm a bit late to the party, as usual. This book was published in 2006 and it was referenced in a recent post of Gav's (Greening of Gavin) Top 11 Books That Changed My World View. 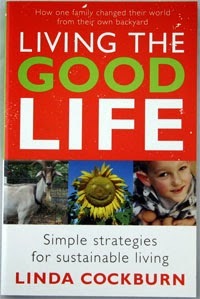 I've actually followed Linda's blog (Living the Good Life) for a little while now but had not read the book. I love the way Linda writes and you can tell she is a reader and loves words. She has given me a new one to play with so watch out peeps. Good one to introduce when you have a room full of slightly inebriated guests. I'm awfully glad that they did this adventure with Caleb. Having a small child involved introduced so many funny and heart warming moments throughout their six month "holiday". This is one clever and involved child and very much loved by equally clever and interested parents. What a childhood he is having/had. I'm making this sound like a light read but Linda's retelling of their experiences living for six months without spending money unnecessarily and doing so in a self sustainable way provides many relevant segue-ways to eye popping facts and figures. Her inventiveness in providing meals solely from their garden and bartered goods is only rivalled by Trev's willingness to partake of snails as a substitute for red meat and forgo his cigarettes and alcohol. I kept my husband in stitches last night (was it around 3am) reading about the demise of Dead and Gone, two dominant male bantams with a penchant for raking their spurs down Linda's calves. Don't worry, Linda got her own back and lets just say that they are "dead and gone". Page 121 I love chooky stories. During the book, when things often got tough, Linda referenced moving to Tasmania. It was funny reading the book about the past knowing that they now live in Tasmania so I guess they got over their fear of hypothermia. 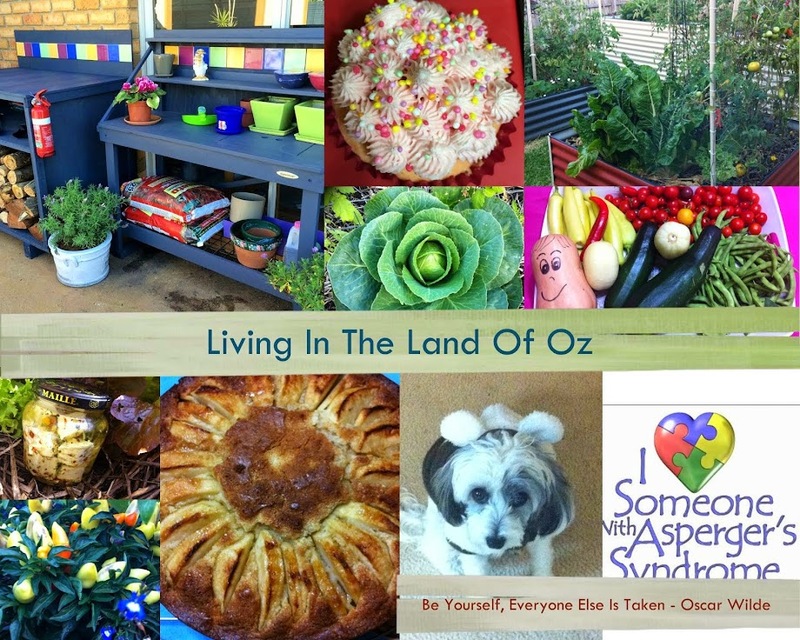 I'm looking forward to going back to the beginning of the blog and finding out about the move from Qld to Tas and how they set up their new place having learnt from their mistakes. Which leads me to another book that arrived this week 5 Acres & A Dream The Book from Leigh's blog ((here) of the same name. I've done this one completely different. Last time I had "Me Time", I spent a weekend starting at the beginning of Leigh's blog and working my way forward. You certainly do get to know someone, their family, their critters and garden well when you immerse yourself into it for a few days. I'm looking forward to now reading the "summarised" version in the book. I managed to finish reading at 3.30pm with just enough time to shower and race over to see Noelle. Its now a week since her hip operations and she is in good spirits (love those morphine patches). Her granddaughter Mia was visiting and i sat patiently while she combed my hair flat (i hate flat hair) and pretended she was a hair dresser. I was rewarded with a big hug on leaving. Have a great week everyone. 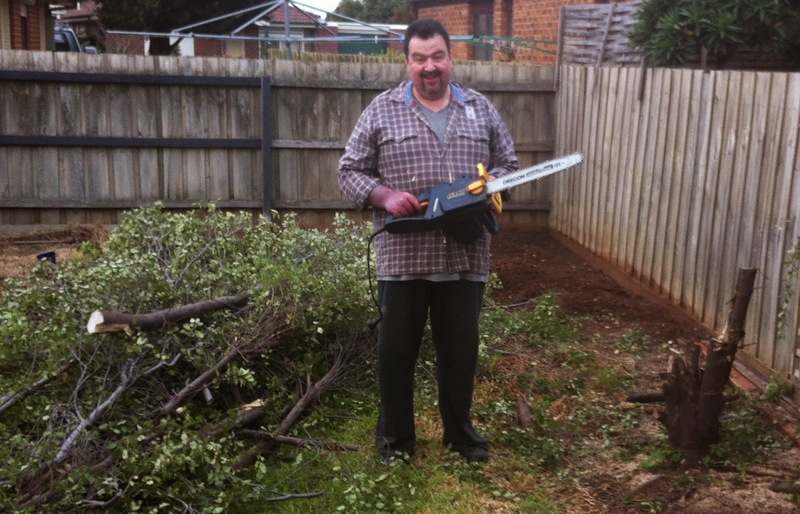 I'm one week from a long weekend which I have extended into a week of gardening - Yeahhhhhhh!!!!! !